Fuchsia are morning-sun plants native to the Caribbean. They are widely used in hanging baskets and 4” pots and are known for the oddly-shaped blooms that drop down from the foliage to show off during the spring. When planning your crop, be sure to choose trailing varieties for hanging baskets and upright varieties for 4” pots. Your customers will love the added color and wide spreads Fuchsia bring to your Mother’s Day offerings. For best results with Fuchsia, we recommend using a constant feed program of 200 ppm N. Maintain a pH between 5.5 - 6.2 to avoid iron deficiency. Fuchsia bloom naturally as the days lengthen. If you are looking for an early crop, you can light your plants starting in late winter to force blooming early in the spring. This will allow for your customers to have a longer peak season with their plants before the summer heat makes them hard to maintain. For Dollar Princess we recommend one pinch 5-10 days after transplant. Additional pinches every 3-4 weeks will create the perfectly-shaped pot. Give the plant 6-8 weeks from the last pinch to produce blooms. 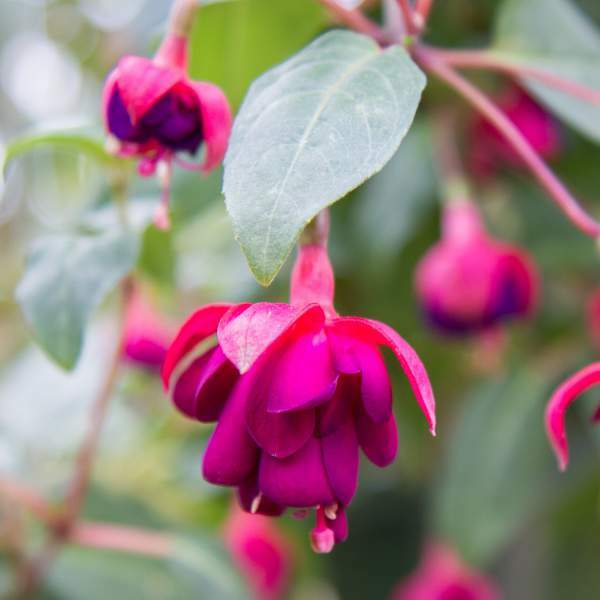 Fuchsia should be spaced adequately to allow airflow and light penetration between the foliage. Usually 2’ staggered centers on baskets will be enough to allow for the spreading foliage to grow. While plant growth regulators are effective, we do not recommend them for Fuchsia. These plants do not normally flower in the winter and will continue vegetative growth without chemical aids. Control height with proper pinching to encourage basal branching. Aphids, thrips, mealybugs and whiteflies are the primary pests attracted to Fuchsia. Dollar Princess are not prone to many other diseases, but watch for botrytis while the days are short. This grey rot is usually associated with wet or humid conditions. You can prevent botrytis by allowing the plant to dry out between waterings, allowing for good airflow in your greenhouse, and spacing to allow the sun to penetrate to the soil level. The most common chemicals used to treat botrytis are Medallion and Banrot. Use them as a drench according to each label’s instructions. We recommend planting 4 starter plants per 10 inch basket (trailing varieties only). Use a well-drained soil in your baskets and plant your starter plants deep, allowing the ellepot to be completely covered by the soil. If you are planting 4” pots, 1 plant per pot (upright varieties only) should be sufficient. Plant it directly in the middle of your pot. Pinch 5-10 days after transplant, once the roots are established. Additional pinches every month may be required to shape your final pot. Remember to give your Fuchsia 4 weeks from their final pinch to reach bloom stage.